A crop of Matt Ryan Tobin’s poster for Bill and Ted’s Excellent Adventure. No one knows if we’ll ever see “Bill” S. Preston Esq and “Ted” Theodore Logan together on the big screen again, but you can see them every day with this gorgeous new poster. 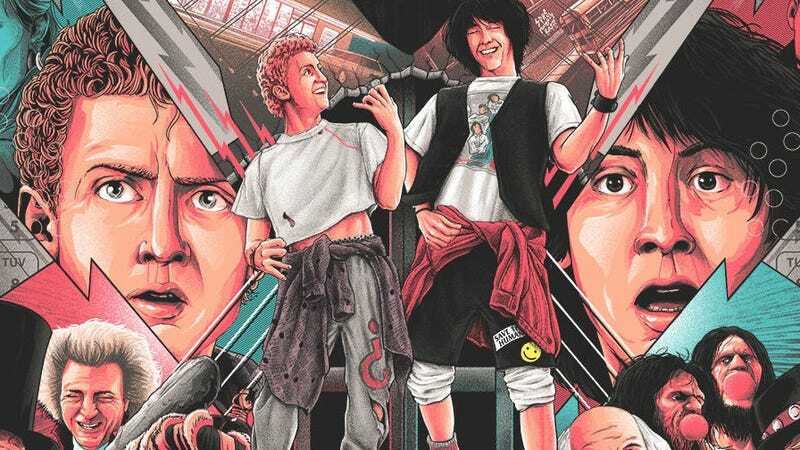 On Wednesday, March 21, artist Matt Ryan Tobin will finally release his poster for Bill and Ted’s Excellent Adventure. I say “finally” because last year, Tobin released a similar poster for Bill and Ted’s Bogus Journey. And while that film is great, it’s not the original. So now you can have both. Here’s the full poster for Excellent Adventure. Matt Ryan Tobin’s poster for Bill and Ted’s Excellent Adventure. Excellent Adventure and Bogus Journey side by side. Together, they have an awesome balance and symmetry. No you don’t need them both, but they sure are nice. If you want to snag a Bogus Journey poster, those are still available here. Excellent Adventure will go on sale at 1:00 pm EST March 21, also on the Skuzzles site. It’s available in a regular edition, a metallic edition, and in a matching numbered set, though there are limits on all of them. For even more info on the posters, visit this link. Bill & Ted Return In Comic Form And The People Behind It Are Excellent! Is Bill and Ted the most realistic time travel movie of all time? Bill & Ted&apos;s Excellent Adventures Continue In This Week&apos;s Comics!